Interface of Helmet Mounted Display System (HMDs) will be the major human-computer interaction interface of fighters in the future. Its icons and color design are important for the efficiency of the entire system in operations. This paper focuses on the problem about target frame of HMDs and design of background brightness to research. According to the data of the behavior experiment based on E-prime, impacts of solid and dotted lines upon users’ visual cognition are compared under backgrounds of different brightness to analyze key elements of such differences, in order to lay a foundation for improving and optimizing interface design of HMDs. Experimental data have effectively indicated the changes based on background brightness and demonstrated that the design scheme of brightness for optimizing target frame is feasible. On the whole, cognitive effects are better for the target frame with changeable brightness as compared with existing target frame no matter how many disturbances there are. The reaction time is about 12 % shorter on average for the former target frame. 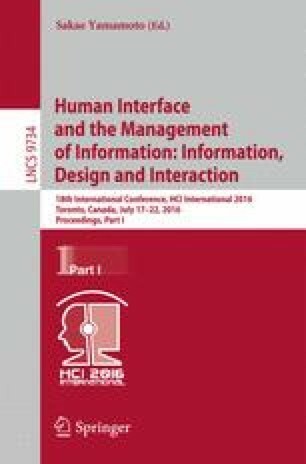 Experimental data analysis and conclusions may provide references for future design of HMDS, to effectively avoid misjudgments and omissions of interface information for the final purpose of increasing utilization efficiency of the system. This paper is supported by National Natural Science Foundation of China (Nos. 71271053, 71471037), Aeronautical Science Foundation of China (No. 20135169016) and Scientific Innovation Research of College Graduates in Jiangsu Province (No. CXLX13_082).